The astronomy "magnitude" scale works backwards: smaller numbers indicate brighter objects. Back in the days before precision measurements of brightness, stars were categorized by eye, with the brightest being "stars of the first magnitude". When more precise measurement became possible, this scale was retained, and extended into the negative numbers for very bright objects like Venus, the Sun, and a few of the brightest stars. The Iridium satellites have enormous, mirror-like antenna arrays. When one of them is angled correctly, it will reflect sunlight straight at you, producing an incredibly bright flare visible even in broad daylight. Very few other satellites have large reflective surfaces other than their solar panels, and solar panels are kept pointed straight at the Sun, so they never generate flares. To give some points of comparison, the Iridum flare listed in your screenshot, at magnitude -5.2, is comparable to Venus at its brightest, visible during daylight if you know where to look. 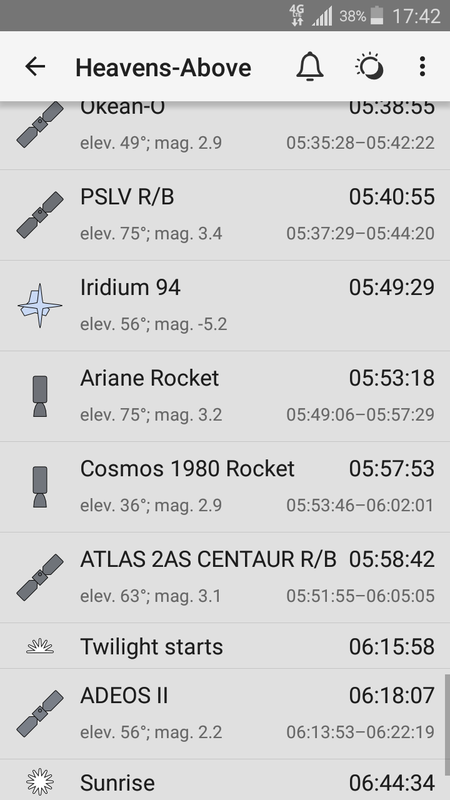 The other satellites listed, with magnitudes in the 2-3.5 range, have brightnesses between that of Polaris, and that of the dimmer stars making up Ursa Minor. Not the answer you're looking for? Browse other questions tagged satellite flare or ask your own question.